We teachers sure know how to make things special for our students. Teachers have some of the biggest hearts I know. I’ve always loved the Christmas season and it’s always been that much more special because I get to enjoy the festivities with my class and those special children first, then go on winter break and enjoy the time with my family. Do you know that wonderful feeling? But when is it too much? A few years ago I started thinking about about that. While I adore Christmas crafts, I had noticed that there were several teachers that did a LOT of crafts. Not only did they spend a lot of their own money on the supplies but there was a lot of time invested in the activities. I didn’t really think that much about it, I just knew that it seemed to be too much for me. Everything starts winding UP at the end of November. 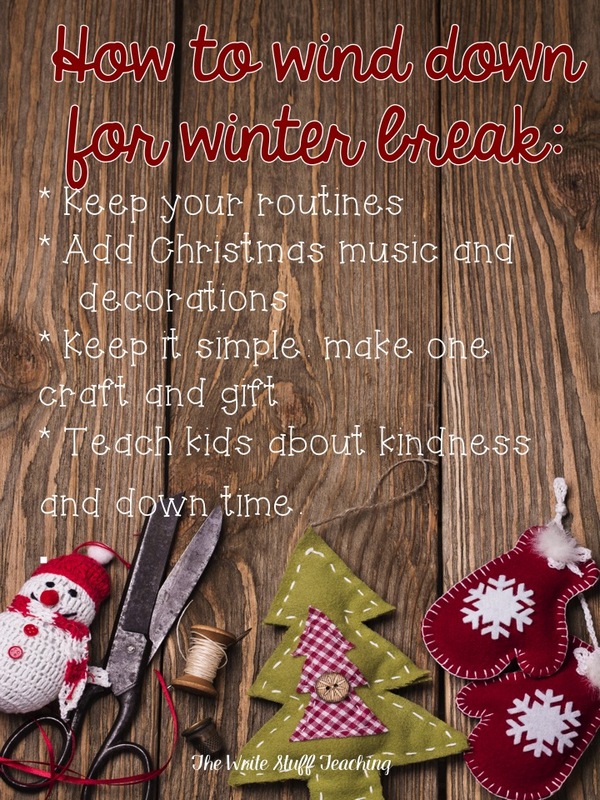 There’s assessments and report cards, daily Christmas concert practice, planning crafts (and shopping for the supplies) and allotting time to do it, and planning (and shopping for supplies) for gifts for the students to make for their parents. Then there’s the Christmas party preparation and clean up. It’s a lot isn’t it? I started noticing that the kids started getting so tired. They were all getting sick. I, too, was so exhausted on the last day of school before break that I slept for 2 days afterwards. I didn’t have time to sleep! I had to prep for my Christmas dinner and get the house ready for my family celebration! I also had to finish my Christmas shopping. (I know I have had parents say to me they are too busy to help with crafts or parties too!) Often after such a stressful and busy time in the classroom, people get sick as soon as they have break. That’s what happened to me once and maybe that was what got me thinking differently. Kids need routines. They thrive on routines. When the Christmas season rolls around, routines are changed to make room for concert practice and festive events like crafts and gift making etc. No wonder kids are so wound up the week before winter break! No wonder we teachers are so stressed and tired! For the last few years, I decided that there were some things that I couldn’t change like practicing for the Christmas concerts (and aren’t those concerts just the best?!) but I could change the rest of my days leading up to Christmas. Here’s how I changed things. I didn’t change anything. That’s right. I stopped changing things each Christmas season in the classroom. I now keep my same routines. I add a little Christmas music in the background as we are working and I put up a Christmas tree and some lovely decorations. I read Christmas stories and I do a few art projects that align with the book which kids always love. We wind down. We wind down because we have all been working so hard in school. Learning is hard work. Teaching is hard work. Don’t you think? Christmas means many different things to different people so I try to honor that by putting more of an emphasis on the gratitude and love at this time of year. I talk to the kids about giving the gift of time to their grandparents and being kind to others. I want my students to appreciate the time of year. We do a lovely craft (because who doesn’t love glitter?) and we make a gift for our parents but nothing is over the top. On the last day or the day before, kids will bring board games from home and a few treats and they socialize together. We may also watch a short little Christmas show to round off the day. 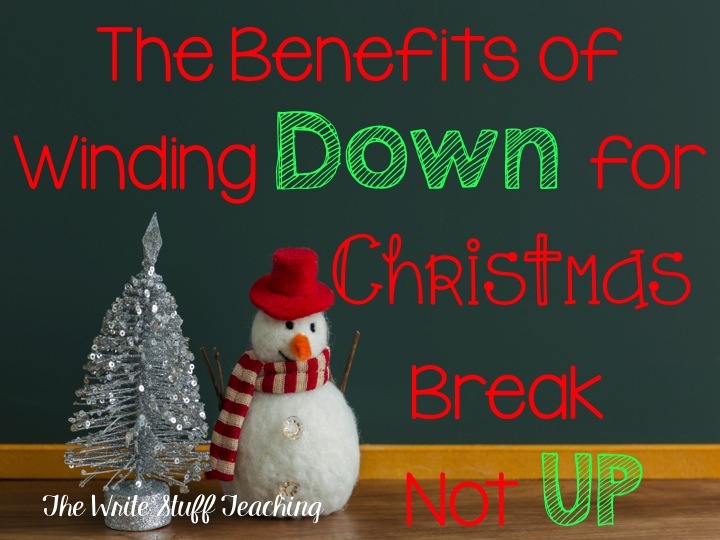 Do you feel a lot of stress and pressure during the Christmas season in school? Am I the only one that winds down? I know this is the last week for many before holidays. I hope you have a wonderful last week. Thanks for sharing! I am so with this winding down and keeping things as normal as possible. Spent too many years of letting them a little loose only to spend my break recuperating. Have a great last week! That's for sure. Thanks for visiting my blog Ms. Perry! Great thoughts Shelley. At my school we seem to be on a treadmill going faster and faster all the time as we try to do just a little bit more each year. I agree that this becomes stressful for the students as they either pick up on teacher stress or just become overwhelmed with all of the extra activities. I will definitely be looking for ways to dial back the pressure on everyone next year.